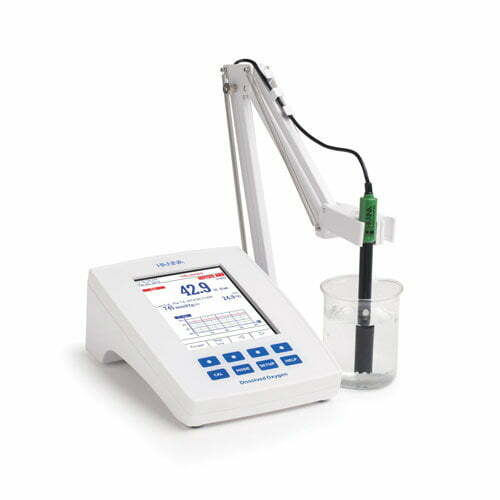 The HI5421 is an advanced research grade benchtop dissolved oxygen and BOD meter that is completely customizable with a large color LCD, capacitive touch keys, and USB port for computer connectivity. The HI5421 is supplied with the HI76483 Clark-Type Polarographic probe that measures a wide range of dissolved oxygen from 0.0 to 600% saturation and 0.00 to 90.00 mg/L (ppm). The HI76483 is only 12 mm in diameter and has a built-in thermistor temperature sensor that compensates for temperature variations from 0 to 50 oC. 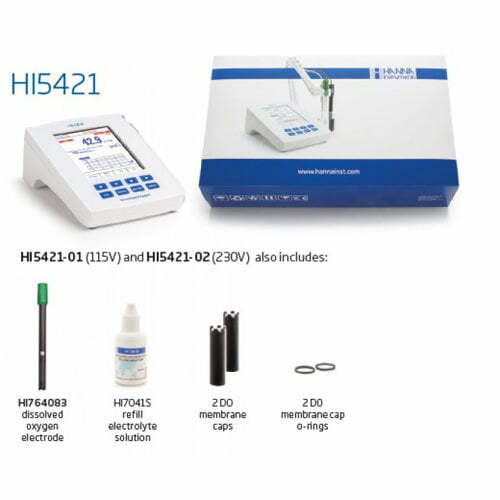 The HI5421 can be calibrated automatically to two points (0% and 100% saturation or 0.00 mg/L and 8.26 mg/L) or to a user-defined value. The calibration data including date, time, and calibration points can be accessed at any time along with the current measurement by selecting the Good Laboratory Practice (GLP) display option. Readings are compensated for barometric pressure by a built-in pressure transducer located in the meter. Calibration of the barometric pressure is a single point with manual entry of current value obtained from local weather service or other device. Barometric pressure is displayed in a multiple choice of units including mmHg, mbar, kPa, mHg, psi, and atm. The HI5421 also allow for automatic salinity compensation with a selectable salinity range of 0 to 45 g/L. 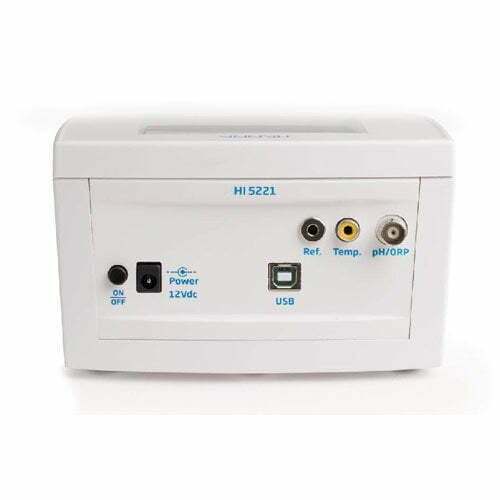 The HI5421 offers three additional measurement modes: Biological Oxygen Demand (BOD), Oxygen Uptake Rate (OUR) and Specific Oxygen Uptake Rate (SOUR). Simply enter values and take readings at appropriate times and the meter will automatically calculate the values. Three selectable logging modes are available: automatic, manual and AutoHold logging. Up to 100,000 data points can be recorded in 100 lots with 50,000 records max/lot and exported to a computer for data review and storage. Highly Customizable User Interface: The user interface of the HI5421 allows the user to show measurements in various modes: basic measurement with or without GLP information, real-time graphing, and logging data. Calibration stability criteria can be adjusted from fast, moderate, and accurate. Programmable alarm limits can be set to inside or outside allowable limits. Color Graphic LCD: The HI5421 features a color graphic LCD with on-screen help, graphic, and custom color configurations. The display allows for real-time graphing and the use of virtual keys provide for an intuitive user interface. Capacitive Touch: The HI5421 features sensitive capacitive touch buttons for accurate keystrokes when navigating menus and screens. There are four dedicated keys that are used for routine operations including calibration and switching measurement modes and four virtual keys that change based upon use. The capacitive touch technology ensures the buttons never get clogged with sample residue. Built in Barometer: The HI5421 has a built-in pressure transducer to automatic barometric pressure compensation of all dissolved oxygen measurements. The barometric pressure can be calibrated to a single point. BOD, OUR and Sour Measurement Modes: An additional three measurement modes are available to measure Biological Oxygen Demand (BOD), Oxygen Uptake Rate (OUR) and Specific Oxygen Uptake Rate (SOUR). Simply enter values and take readings at appropriate times and the meter will automatically calculate the values. Choice of Calibration: Automatic standard recognition is available for two points at 0% and 100% saturation or 0 mg/L and 8.26 mg/L. A user standard option is available for a user defined value. GLP Data: HI5421 includes a GLP Feature that allows users to view calibration data and calibration expiration information at the touch of a key. Calibration data include date, time, and calibration points. Data Logging: Three selectable logging modes are available on the HI5421: automatic, manual, and AutoHold logging. Automatic and manual logs up to 100 lots with 50,000 records max/lot, with up to 100,000 total data points. Automatic logging features the option to save data according to sampling period and interval. Data Transfer: Data can be transferred to a PC with USB cable and HI92000 software (both sold separately).